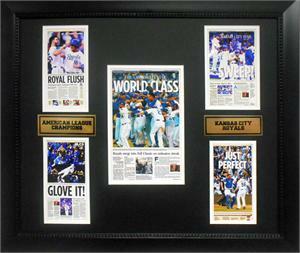 This is a truly unique collectible showcases the Kansas City Star Front Page and Sports Page covers from the playoffs. The 5 photographs are double matted and mounted in a high quality 20x24 frame and complemented by two metal nameplates. Licensed by the Kansas City Star.